Sometimes I get tired of walking or biking in my neighborhood or adjacent historic areas and long for some adventure! So this last Sunday afternoon I opted to explore the new Lagoon Park Trail that I keep hearing so much about. After loading my trusty two wheeler up in the back of my car I headed eastward. For those of you who are not sports-oriented, Lagoon Park is a large city athletic park located off Congressman Dickinson Drive at the northern bypass. The Park houses a softball complex, 17 tennis courts, and an 18 hole golf course. To get there, you turn right at Gunter Industrial Park and then left at the Pete Peterson Lodge. In 2011 a group of local businesspeople and interested citizens saw an opportunity for the other 176 acres of open space at Lagoon Park and began to develop plans for a recreational trail. Through a partnership with the city, an ADECA ($100,000) construction grant and private businesses, the trail construction got underway. It includes a pedestrian trail, a biking trail loop and single-track nature trail. 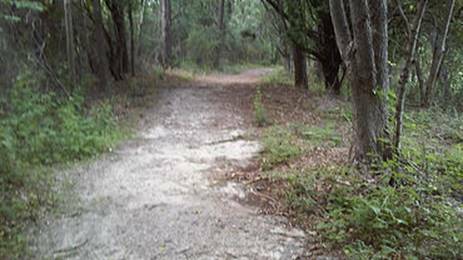 To date the Trail Group has developed 5.9 miles of walking, running and biking trails. With thousands of volunteers, they have cleaned and revived much of the undeveloped parts of the Park. 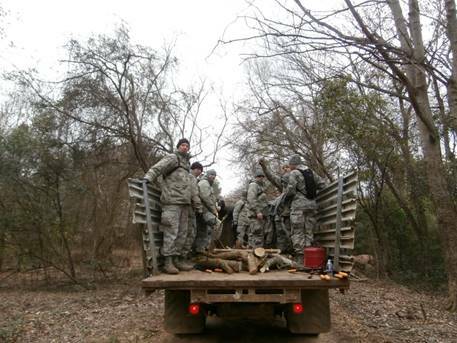 The group has paid special attention to leaving natural habitats undisturbed for wildlife. The Trail weaves through large sections of mature forest, a creek, meadows, and a wildlife wetland. Future plans include more trails and an outdoor educational facility. You can park at Pete Peterson Lodge and enjoy a picnic in the shelters. Then turn the kids loose in the playgrounds. 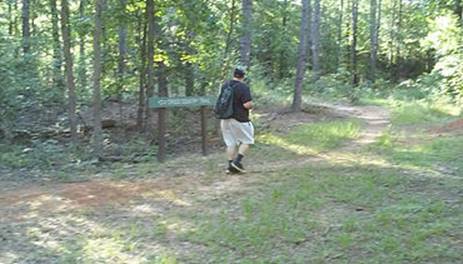 The walking or biking trails go both north and south crisscrossing the parking lot. There’s a more difficult dirt biking trail, at least more difficult for a “senior” like me. Did I really think I could haul it up that steep hill? Dirty hands and a busted lip later, I now know the answer to that. On the Trail at the overlook gazebo, you can rest and birdwatch over the wetlands area. You can view several young herons, an assortment of tortoise species, beautiful native wildflowers and (I’m told but have not experienced) a variety of reptiles. I saw lots of families with strollers, folks walking dogs, bike riders like me, exercise enthusiasts trying hard to get the proper effects with muscle twitch reactions, runners and others just sitting on the banks of the ponds enjoying a lovely Sunday afternoon. 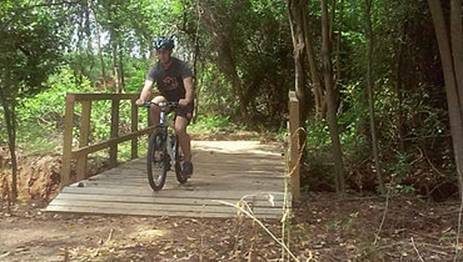 The Lagoon Park Trail has added immeasurable value to Montgomery. 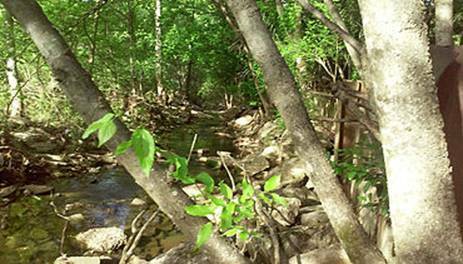 With its easy access from Midtown, it’s a great opportunity for outdoor recreation. That’s essential for healthy living and quality of life. With our great weather, Lagoon Park Trail has the potential to be Montgomery’s premier outdoor recreation site year round. Find out more at www.lagoonparktrail.com or friend “Lagoon Park Trail” on Facebook to get daily reports and volunteer opportunities.